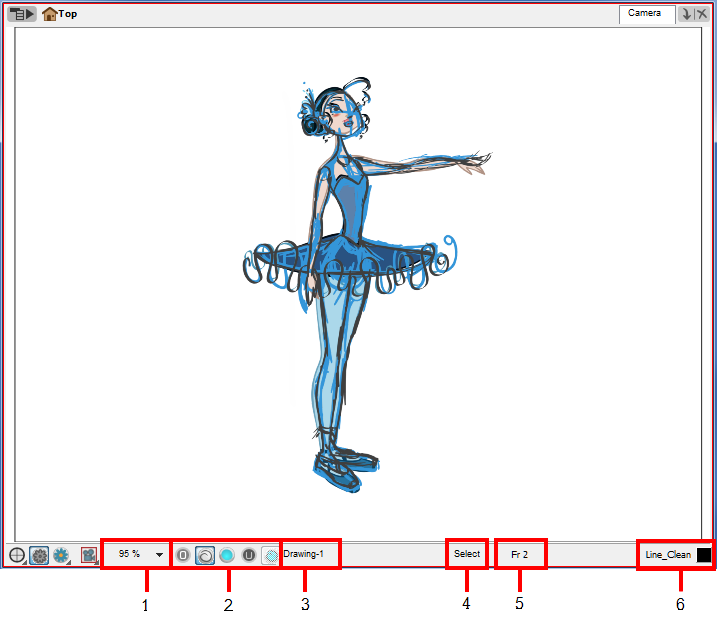 In Toon Boom Harmony, you can draw in either the Drawing view or Camera view. Although the two views are similar, when it comes to drawing, there are some differences. In the Camera view, you can use the Onion Skin feature to display previous and next drawings. By default, all the enabled drawing layers in the selected frame are displayed, letting you edit them together. This way, you can use the Select tool to select many objects from individual layers at once. To make easier to select objects on a single drawing, you can set a preference. Select Edit > Preferences and select the Camera tab, then select the Select tool Works on Single Drawing option. ‣ In the Timeline view, click the Onion Skin icon of the desired layer. By locking a layer, you can prevent yourself from being able to select it in the Camera view, while keeping the drawing visible as a reference and disabling the layers you don’t want to display in the Camera view. ‣ In the Timeline view, click the Lock icon of the layer you don’t want to edit. 1. In the Timeline view, click the check box corresponding to the layer you want to hide. To make the camera frame size always match the size of your view, select the Fit to View option. Click the drop-down arrow and select a zoom level or press  and . • Overlay: Switches to the drawing’s Overlay layer. This layer is located above the Line Art layer. The default keyboard shortcut is [:]. • Line Art: Switches to the Line Art layer of the drawing. The default keyboard shortcut is [L]. • Colour Art: Switches to the Colour Art layer of the drawing. The default keyboard shortcut is [L]. • Underlay: Switches to the drawing’s Underlay layer. This layer is located under the Colour Art layer. The default keyboard shortcut is[:]. • Preview mode: Switches to Preview mode, so you can see both Line Art and Colour Art layers simultaneously. The default keyboard shortcut is [Shift] + [P]. You can display the Preview mode drop-down menu and select the Underlay and Overlay layers if you want to show all four of them at the same time. To activate the Preview Mode button in the Camera view bottom toolbar, you must enable the Current Drawing on Top option. 1. In the Camera bottom toolbar, click on the Camera Option button. 2. In the drop-down menu, enable the Current Drawing on Top option. See Show Current Drawing on Top. The Tool Name field displays the name of the selected tool. If you override a tool using an overriding keyboard shortcut, the tool’s name will be highlighted in red letters—see Override Tool to learn how to temporarily override a tool. This field displays the current displayed frame of the animation. This field displays the current colour name and its colour swatch. You can open the Colour Picker by double-clicking the colour swatch—see Colour.